SAN JOSE, Calif., May 18, 2009 - Acer America, part of the world's third largest PC company1, today extends its industry-leading line of netbooks with two new models optimized for mobile customers - the industry's first 11.6-inch Acer Aspire One AO751h and the 10.1-inch Acer Aspire One AOD250. The new Aspire One AO751h lets customers attain a new level of productivity and efficiency with its large 11.6-inch high-definition screen and full-sized keyboard. Thinner than previous generation netbooks, the AO751h still comes with all the same easy-to-use features, sophisticated design and incredibly portable form factor that have made Acer netbooks so wildly popular. The netbook's large 11.6-inch high-definition LED-backlit widescreen (16:9 ratio) display is large enough to easily view multiple windows and reduces the need to scroll to view Internet sites, providing a better end user experience. Plus, the full size keyboard is easier and more comfortable to use, even for touch-typists. "As the worldwide leader in the netbook market, we designed our new 11.6-inch AO751h after careful consideration about how customers use and most enjoy their netbooks," said Sumit Agnihotry, vice president of product management for Acer America. "We predict that the larger display and keyboard will be a game-changer for mobile consumers looking to take it to the next level with the ultimate mobile device." Acer is the global market share leader in the netbook category with 30.5 percent marketshare with 1.8 million units shipped in Q1 2009 according to DisplaySearch2. The company will deliver these new offerings in the U.S. through its extensive network of retailers and distributors. 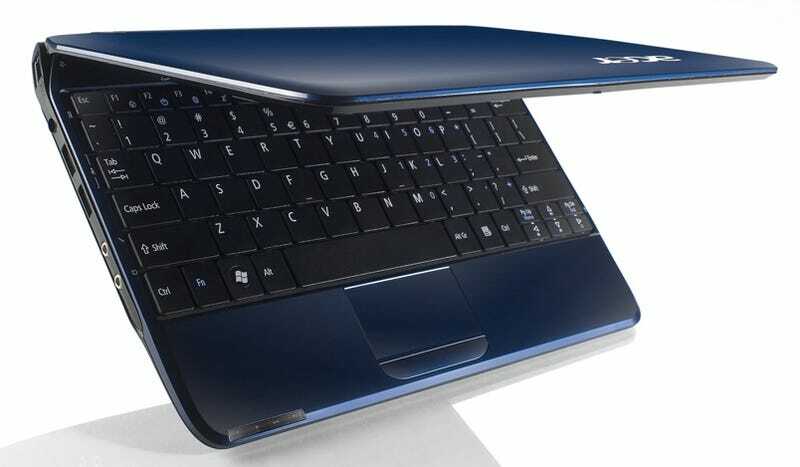 In addition, the Acer Aspire One AOD250 will satisfy the demands of mobile consumers who want a compact, light-weight netbook for Internet access and communications. With a 10.1-inch display and a thinner and lighter design than its predecessor, this new netbook is ideal for anyone on the go. Agnihotry added, "These two new Acer Aspire One offerings will satisfy the needs of today's extremely diverse mobile users - from professionals who need a streamlined, highly mobile form factor to students who want a productivity-enhancing large keyboard and display. In all cases, Aspire One customers get a reliable, easy-to-use, stylish device that will let them remain connected." quick and easy way to post updates, send tweets, view and respond to video links, and stay connected. Select Acer Aspire One models come with the option for 3G broadband wireless connectivity. Consumers can enjoy being productive and staying in touch even longer with the new Acer Aspire One netbooks; they deliver exceptional everyday battery life. The extended 6-cell battery for the AO751h can provide uptime of up to eight hours, while the 3-cell battery can provide four hours of uptime.2 The AO250's standard 3-cell battery can provide up to three hours and 15 minutes of battery life, while the 6-cell battery can provide up to six hours.2 The new devices use the latest Intel(r) Atom(tm) processors (N270 on the AOD250 and N270 or Z520 on the AO751h) that further extend battery life and power efficiency to deliver excellent mobile performance and Internet connections on the go. such as the color-rich chassis choices (Diamond Black, Ruby Red, Sapphire Blue and Seashell White) along with the metallic hinge with a colored accent. Both models weigh less than three pounds (2.75 pounds for the AO751h and 2.44 pounds for the AO250), so they won't weigh down a compact backpack or purse. The Acer Aspire One AO751h uses a clever Multi-Gesture Touchpad that allows users to pinch, flick and swirl their fingers across the touchpad for more natural photo and video viewing as well as intuitive navigation of websites such as Google Earth. The Multi-Gesture Touchpad allows users to scroll, zoom in and out and flip through web pages, photos, spreadsheets and more. Both new models feature a soft-touch palm rest to increase typing comfort. display also includes a large viewing area for Web page navigation and reviewing documents. Well-equipped with a full 1GB of memory and 160GB of hard drive space, the new Acer Aspire Ones are ready for customers who want to take their digital media and files with them. Select new models will feature up to 2GB of DDR2 memory and up to a 250GB internal hard drive, providing even more capabilities and storage space for mobile enthusiasts. reader, while the AO751h also features a dedicated SD card slot. $379.99. The Acer Aspire One D250 10.1-inch netbook line has a starting MSRP of $298. Models in these lines are available now. The Acer Aspire One comes with additional preinstalled software includes Microsoft Works with Office Home and Student 2007 Trial, Microsoft Office Personal 2007, Acer eRecovery Management, Acer Launch Manager, Adobe(r) Reader(r), McAfee(r) Internet Security Suite, Microsoft(r) Office Trial 2007.
offered through specific channel partners. All Acer netbooks are backed by toll-free service and support.